Athens, Greece. Be part of the great celebration of disability, technology, aesthetics and culture which is taking place on the 15th, 16th and 17th of May 2009. The EXPO, organized annually by ENAT founding member, DISABILITY NOW, includes a showcase of accessible tourism offers by ENAT members and associates. Every year, Autonomia EXPO presents the topmost technological, artistic, social, aesthetic and cultural achievements of the disabled people’s community and of those who work in the fields of rehabilitation, special education, health, social care, tourism and leisure. ENAT Stand at the 2008 EXPO. ENAT members and tourism businesses are invited to present their accessible tourism offers in an Open Seminar under the heading, "Opportunities for Accessible Tourism in Greece", taking place in the EXPO Conference Room on Sunday 17 May from 12 o'clock. Presentations will be given in the Greek language, with the possibility for short summaries in English. 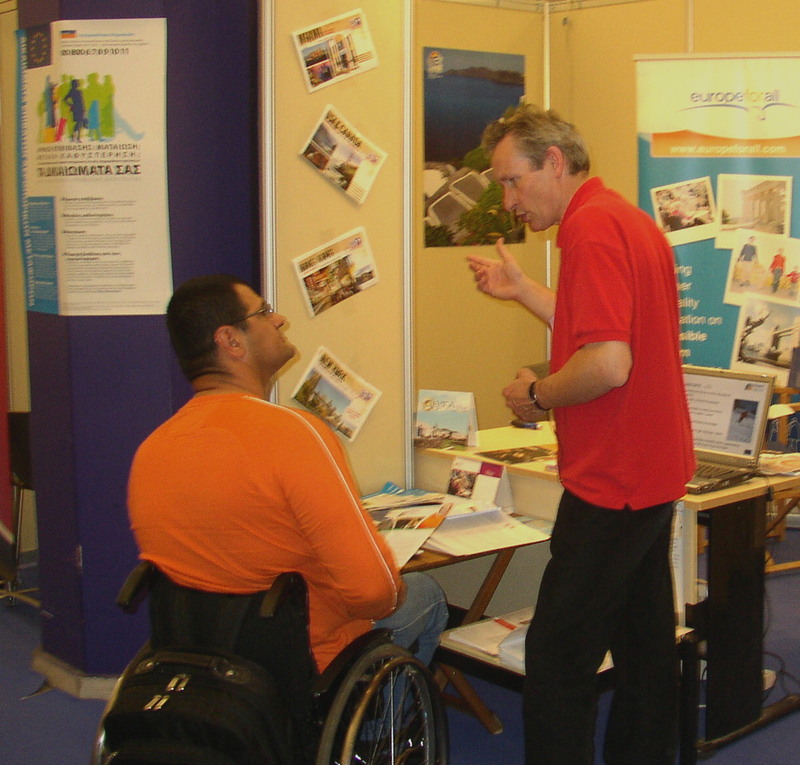 ENAT is also happy to accept promotional materials from accessible tourist and travel organisers, to display on our Stand and distribute on your behalf to the public. For details about where to send your promotional materials or to sign up as a speaker in the ENAT Seminar, please download the PDF document (in Greek and English) from the right-hand column of this page. We look forward to meeting ENAT members, associates and many new faces at the AUTONOMIA EXPO! Entrance to the EXPO as well as participation in the Seminar, as a speaker or member of the audience, is free of charge. Visit the AUTONOMIA EXPO Website.